There have been a bunch of you that have been hearing the buzz about the new Saving Star program. I have been testing it myself and, I have to say, I’m loving it. Saving Star just recently launched and is already available at over 100 chains in 24,000 stores nationwide. There is nothing to clip or print as it’s 100% digital. You sign up with Saving Star and register your store loyalty card(s). You select the eCoupons you like on Saving Star. They get automatically linked to your store card. When you use your store loyalty card at checkout, the eCoupon amount is added to your Saving Star account. (You will not see it deducted at the register). 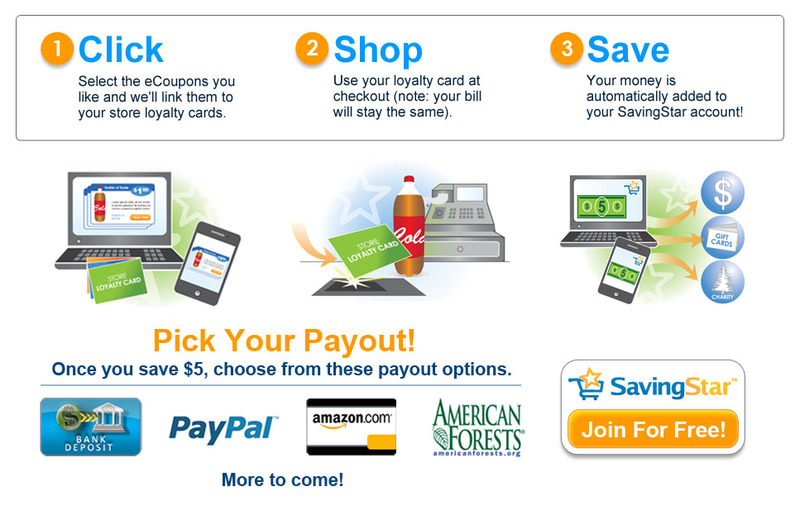 So, you can us all your regular coupons, catalinas or even other eCoupons that you would normally use. You will see your Saving Star account credited with the amount in approx 7-30 days depending upon where you shop. Once your SavingStar account reaches $5 in savings, you can pick your payout from a bank account deposit, a PayPal account deposit, an Amazon gift card or a donation to charity. So, this is really like an rebate. And an easy rebate. You just Click, Shop & Save!